As the #MeToo movement gains ground, 20 women journalists who have worked with ‘The Asian Age’ newspaper, came out in support of their colleague Priya Ramani who has accused union minister MJ Akbar of sexual harassment, a joint statement issued by them said. The journalists have urged the court to hear their testimonies against MJ Akbar, claiming that some of them suffered sexual harassment by the minister and others have been a witness to it. “Ramani is not alone in her fight. We would request the honourable court hearing the defamation case to also consider the testimonies of sexual harassment of some of us at the hands of the petitioner, as also of the other signatories who bore witness to this harassment,” the journalists said in the joint statement undersigned by them. Meenal Baghel who worked for Asian Age (1993 to 1996), Manisha Pande (1993-1998), Tushita Patel (1993-2000), Kanika Gahlaut (1995-1998), Suparna Sharma (1993-1996), Ramola Talwar Badam (1994-1995), Hoihnu Hauzel (1999-2000), Aisha Khan (1995-1998) and Kushalrani Gulab (1993-1997) have signed the statement. Kaniza Gazari (Asian Age 1995-1997), Malavika Banerjee (1995-1998), AT Jayanthi (1995-1996), Hamida Parkar (1996-1999), Jonali Buragohain, Meenakshi Kumar (1996-2000), Sujata Dutta Sachdeva (1999-2000), Reshmi Chakraborty (1996-98), Kiran Manral (1993-96) and Sanjari Chatterjee are the other journalists to sign the statement. One journalist from Deccan Chronicle, Christina Francis (2005-2011), also signed the statement. “What Akbar has demonstrated through his legal actions is his refusal to introspect, acknowledge or atone for his actions that have caused immense pain and indeed harm to many women over the years. “He himself, in the meanwhile, continues to enjoy enormous power and privilege as minister and Member of Parliament,” the statement said. “When Ramani spoke out against him in public, she spoke not only about her personal experience, but also lifted the lid on the culture of ‘casual misogyny, entitlement and sexual predation’ that Akbar engendered and presided over at The Asian Age,” it said. Many journalists from multiple media platforms have come forward with their stories of harassment against the Minister of State for External Affairs under the social media campaign ‘#MeToo’ against sexual misconduct. 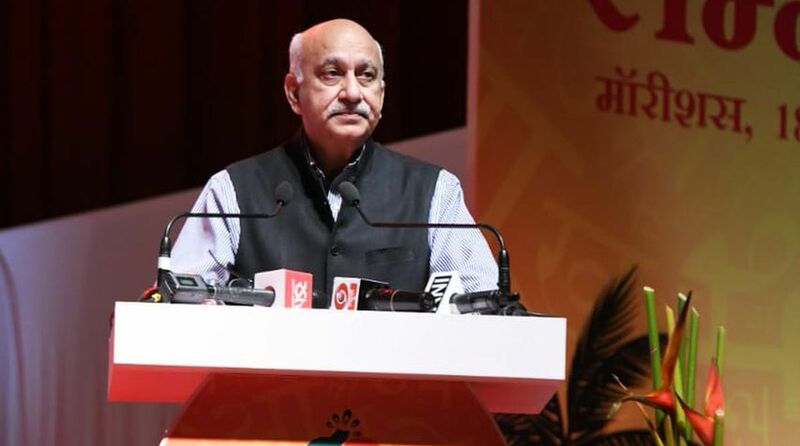 MJ Akbar, however, has denied the allegations and filed a criminal defamation case in a New Delhi court on Monday against journalist Priya Ramani. Akbar, who returned from an official tour of Nigeria on Sunday, had issued a statement claiming that the allegations against him are “false and fabricated”. Reacting to Akbar’s statement, Ramani told the media that “truth is the best defence” and she is not worried about the possibility of a defamation case. “He has decided to brazen it out. He’s clearly being supported by a political establishment whose Beti Bachao slogan rings more hollow every day. There is no conspiracy against Akbar. None of us — unlike him — has any political ambitions. We are speaking up at great cost to our personal and professional lives,” Ramani told The Telegraph. Ramani had on 8 October posted a tweet naming Akbar, which inspired other journalists to come out with their own stories of alleged harassment at the hands of the journalist-turned-politician.